Varicose veins are larger. They can appear raised with a bluish color and can become quite painful. Although spider veins and varicose veins carry blood, they are not part of the venous valve system. 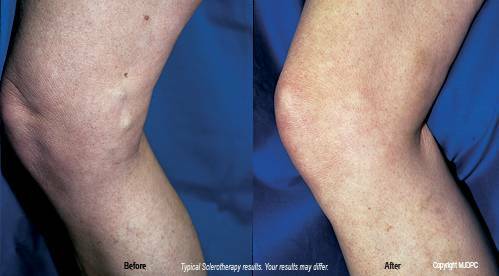 Dr. Roger Orsini performs a simple office procedure called Sclerotherapy for patients in Maryland, Delaware and Washington, DC to permanently eliminate or minimize your spider veins and varicose veins. Prior to treatment, we will review your complete medical history to determine how long you have had a problem with your veins and the severity of the problem. We need to know if the problem is exacerbated by physical activity and if there has been any prior surgery or treatment on your veins. Dr. Orsini may test to determine if the venous system is affected. If it is, surgery may be advised before Sclerotherapy is attempted. If the area to be treated can be saved, Sclerotherapy will be recommended. 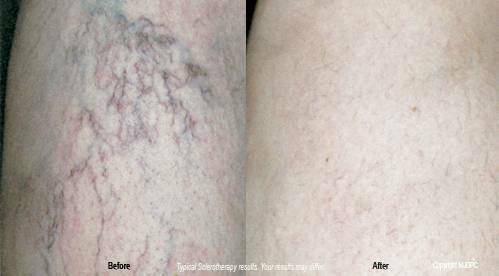 Are there other vein treatments available? After Dr. Orsini performs Sclerotherapy, you may be asked to wear special heavy-duty stockings to help keep pressure on the veins. This will reduce bruising and help keep the treated veins closed. Bruises around the treated areas usually disappear after the first week. A tan or brownish pigment may persist for 6 - 8 weeks when larger veins are involved. Occasionally, small clots can develop at the injection site. These are not a cause for concern and may be removed to allow healing to progress.